Despite what the movies may have you believe, it’s a rare person indeed who fears nothing. Everybody is afraid of something- it may be an animal that gets your pulse racing (like a shark or a snake), or it may be something more mentally-based (like a fear of heights), but everyone has something that strikes fear into their hearts. Even DC Comics superhero Batman was afraid of something (bats, in case you didn’t know), yet he was able to embrace his fear and make it into his own insignia. Like Batman, some people are able to gradually overcome their fears (through various forms of behavioural therapy, treatment and desensitisation) but for others it’s not so simple. For some, their fears can be quite debilitating, leading them to avoid certain activities, places or events. This anxiety disorder is more commonly known as a phobia, and believe it or not, there are names for all types of phobias that exist in our world. In this book, we are introduced to many different types of phobias- some which you may have heard of, some which you may suffer from, and some which you probably won’t believe exist! Each of the phobias are separated into a category and these are set out as ‘chapters’ within the book- animals, activities, nature, objects, people, places and the unbelievable. On each page (or double page spread), a phobia is named, its meaning is given and a relevant picture accompanies them, so you can see exactly what that fear is all about. Perhaps you know someone who has coulrophobia (a fear or clowns) or aichmophobia (a fear of needles). Maybe you know someone who has anuptaphobia (a fear of staying single), or their opposite, gamophobia (a fear of marriage). Some of the more bizarre fears mentioned include a fear of things to the left side of the body (levophobia), a fear of peanut butter sticking to the roof of your mouth (arachibutyrophobia) and a fear of long words (which is quite ironically hippopotomonstrosesquipedaliophobia). 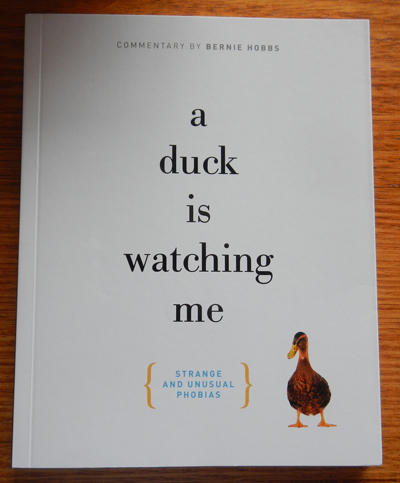 A Duck Is Watching Me provides an interesting list of some of the world’s more strange and unusual phobias, and is sure to create an entertaining dinner party conversation if so mentioned. You’ll be amazed at some of the phobias that exist, and with an extended and alphabetised list printed inside the front and back inside pages of the cover, you’re bound to discover a phobia that you never could have imagined!